Steele: GOP Is "An Elephant Mired in Its Own Muck"
The 50-year old former paid Fox News contributor who created the "Drill, baby, drill" chant is trying to create a more inclusive GOP but his methods have been a bit unorthodox. 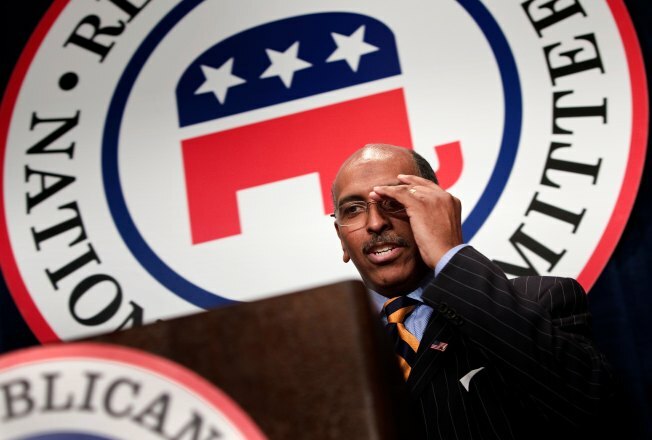 Republican National Committee chairman Michael Steele is trying to re-brand the Party -- but many wonder if the GOP leader is become nothing more than a punchline. The 50-year old former paid Fox News contributor who created the "Drill, baby, drill" chant is trying to create a more inclusive GOP but his methods of doing so have been a bit unorthodox, the New York Timesreported on Sunday. "I'm trying to move an elephant that's become mired in its own muck," he told the New York Times for Sunday editions. "You can say, 'He's crazy, he's running off at the mouth.' Or you can say 'It kind of makes sense, and I get it.'" Many in the Party fear Steele, who often falls victim to his own hastiness, will become nothing but a reliable punchline as he drops "friggin' awesome" slang to try to appeal to young voters and accepts offers from Stephen Colbert to participate in a rap battle. But Steele told Politico last week that GOP critics were nothing but "nervous Nellies" and that he has reigned in his public speaking. "I know some folks in Washington feel that they're kind of on the outside of this -- that they don't have the day-to-day blow by blow of what I'm doing," he told the site. "And that's exactly how I like it. I want to be about the business of putting in place a good infrastructure that will enable me to go out and build a better brand, a stronger brand, for the GOP." The up-and-comer in the Party likened working with him to riding an unpredictable roller coaster. "I'm very spontaneous," he told the Times. "Be prepared; you have no idea. ... Just buckle up and get ready to go."